Imagine stepping back in time to the Victorian Era, 1886, to a place of unspoiled beaches, multitudes of deer, quail, pheasant, and turkey roaming about, and long leisurely days in the sun. You can still get a similar feeling today when you drive up to Jekyll Island Club Resort, a historic hotel — without so many of the wild animals. Jekyll Island was purchased by the wealthy elite of this country in the late 1800s for their winter hunting camp/playground. The Rockefellers, Morgans, Vanderbilts, and others came to Jekyll to escape the harsh winters of the north and spend time with their families on this wild island off the coast of Georgia, halfway between Jacksonville, Florida, and Savannah, Georgia. The island became what was known as the richest, most inaccessible club in the world. Even the Carnegie’s were turned away for membership, rumored because they came from Scotland as penniless teenagers before making their fortune. So the Carnegie’s decided to purchase their own island! The entire island of Jekyll is now a state park, in which you pay your entrance fee before ever driving on the island. 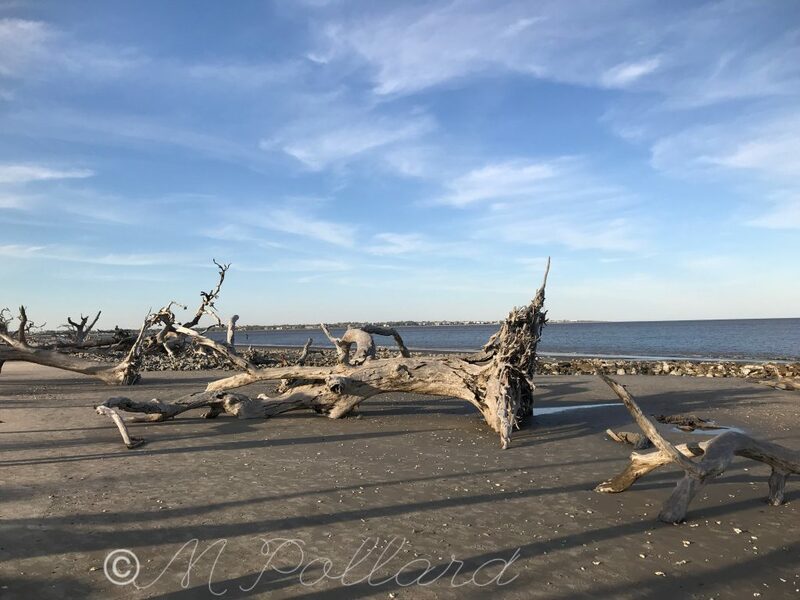 Unlike the surrounding islands of Amelia and St. Simons Islands, Jekyll still has a very natural feel to it, as there is a 65/35 rule in place, where 65 percent of the land must remain undeveloped. When my adventurous friend, Belinda, and I arrived at the resort, we were met by the valet for a complimentary park. We watched the guests, all dressed in white, playing crochet on the lawn while they sipped iced tea and mint juleps. We were immediately swept back in time. The Wharf, one of the resort restaurants, is just a short walk and located on the bay side of the island. As we browsed their impressive menu, we hurriedly ordered our Mint Juleps to join in the spirit of the day. 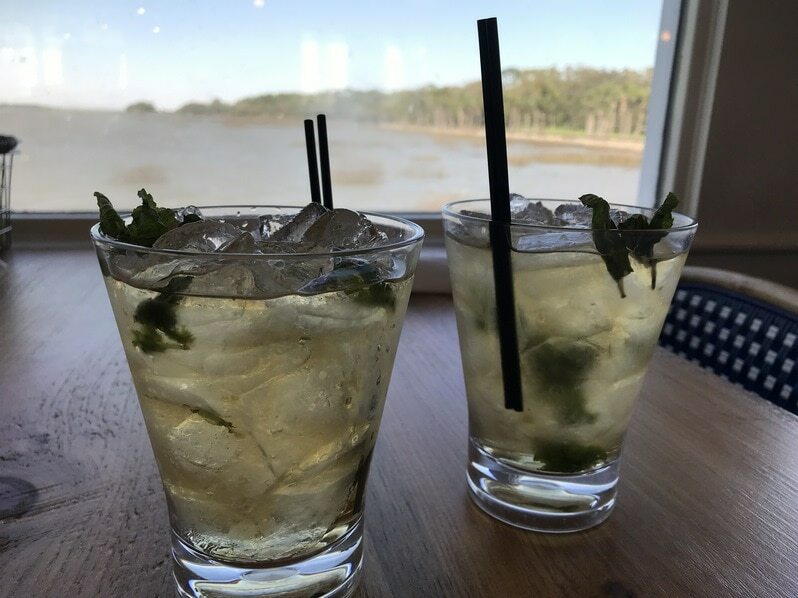 We savored our drinks while watching the boats going by and the activity along the shores of the bay. It’s all about The Beaches! Driftwood Beach, at the northern shore, is the perfect place for your family beach photos. Huge trees and branches are washed onto the shore at this tree graveyard. Constant erosion of the beach creates a landscape of preserved, fallen trees. I can see that my grandchildren would love playing on this natural playground. I had to climb a few trees myself. 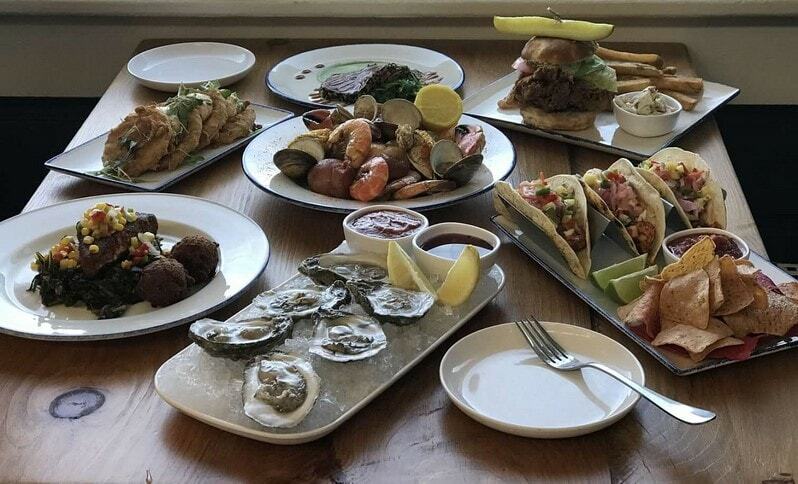 It’s no wonder that portions of “The Walking Dead” were filmed here. I found myself looking around the largest trees just to make sure no zombies were left behind. Great Dunes Beach, South Dunes Beach, and St. Andrews Beach are all very popular. Each one offers a different view. St. Andrews is popular for dolphin and bird watching. The giant dunes on Jekyll, much larger than our Alabama gulf beach dunes, offer the island protection from storms. Beaches that offer shade are my favorites. 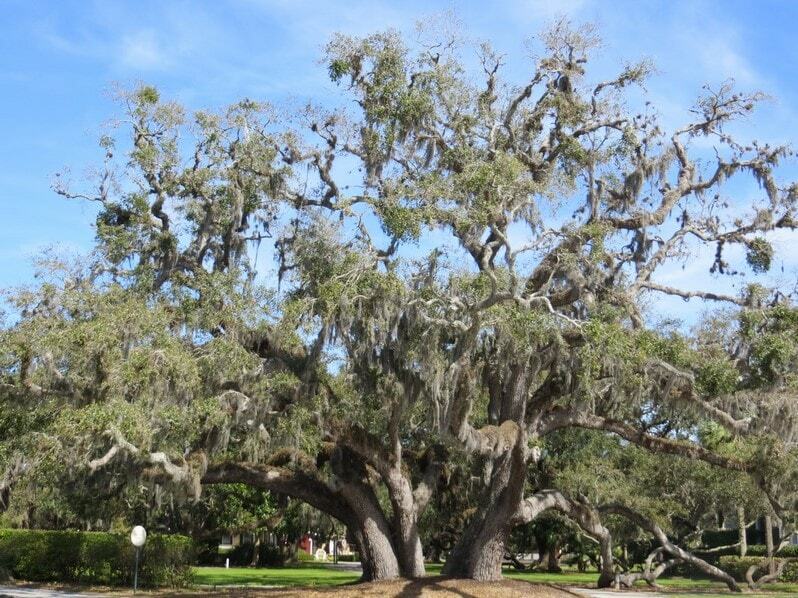 And these beaches don’t offer just any shade, but the shade of a giant live oak with Spanish Moss dripping from it. 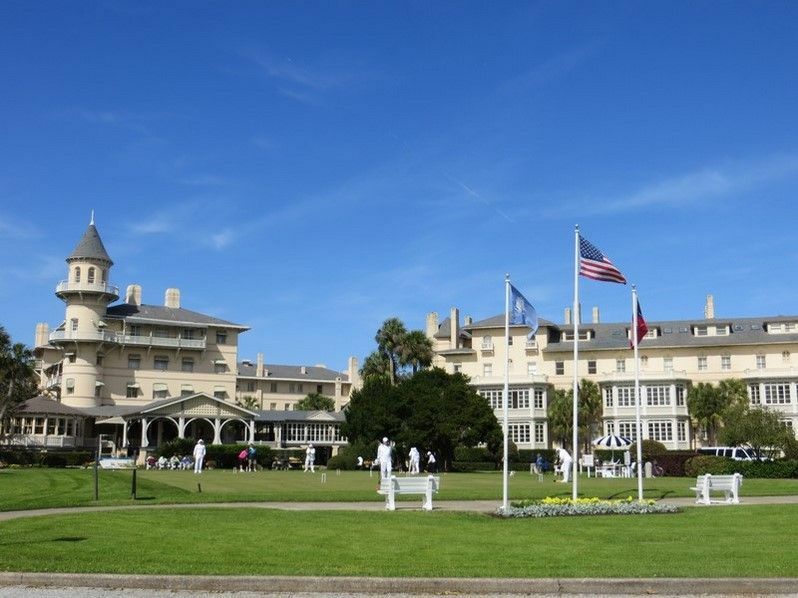 Plan your next conference at Jekyll Island Convention Center. It is one of the few oceanfront convention centers on the east coast. The convention center can accommodate up to 2000 people. Dinner at the Grand Dining Room was relaxing and peaceful. The piano man was gently playing the ivories to sweet melodies while we dined. We were seated close to the inviting fireplace amongst white tablecloths and waiters hustling to meet our needs. 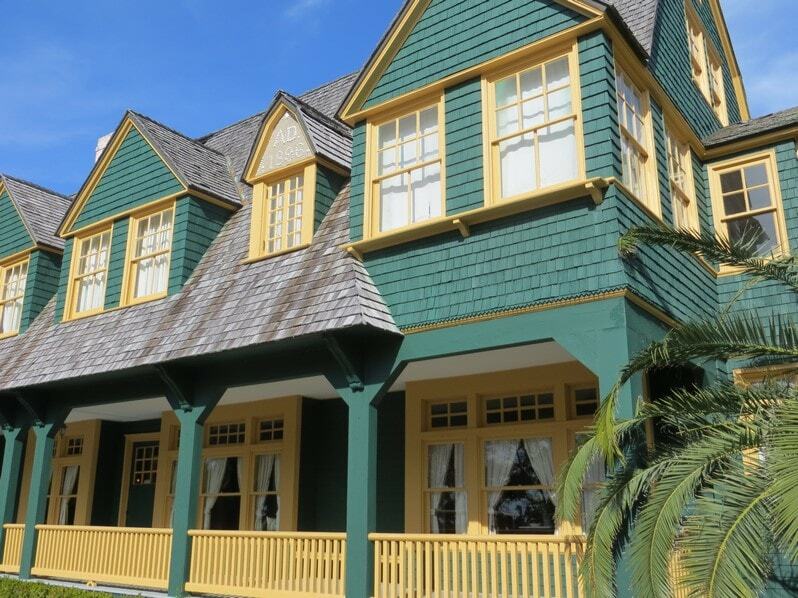 They offer breakfast, dinner, an award-winning Sunday brunch, as well as Victorian tea on Friday and Saturday at 4 pm. The scallops were melt-in-your-mouth delicious, and the shrimp and grits were exceptional. We will look for an opportunity to come back here to dine. The Passport to the Century Tour at the resort took us on a narrated, open-air tram ride around the property and into two large homes (they call them cottages) built in the 1800s, with a visit also to Faith Chapel. We visited Moss Cottage (see below), whose past owners were William Strothers and George Henry Macy, president of Union Pacific Tea, which was later A&P. Several tours are available including The Rockefeller Experience Tour and the Faith Chapel Tour. 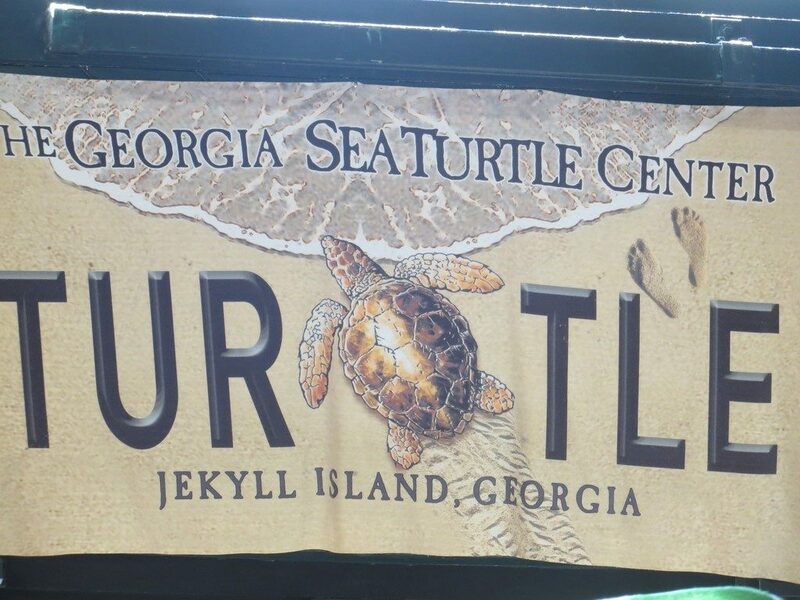 The Georgia Sea Turtle Center is located close to the hotel. Five of the world’s seven sea turtles are found off the coast of Georgia: loggerhead, green, leatherback, Kemp’s ridley, and hawksbill. Sea turtles face threats including entanglement in or ingestion of plastics, collisions with boat propellers, accidental drowning in shrimp and fishing nets, poaching and habitat destruction. The volunteers at the center were well-informed and enthusiastic. They approached us and told us all about the schedule for the day with feedings and informative talks available. 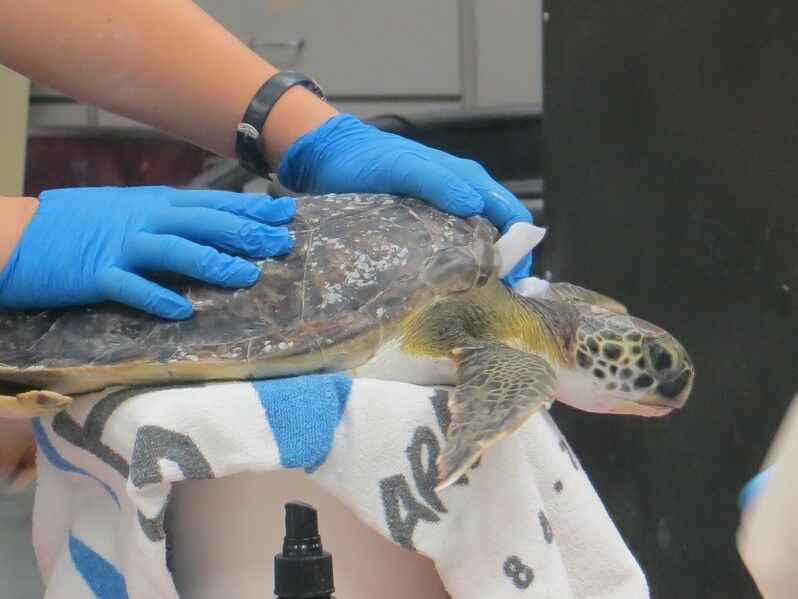 We curiously watched through the extra-large viewing window as the veterinarians treated a sick turtle. Don’t miss the separate building in back which houses the larger turtles in swimming pools for rehabilitation. This would be a fun, educational stop to bring kids and grandkids. Anything you ever wanted to know about sea turtles you can learn here. Volunteers work tirelessly during turtle nesting season, late-May to mid-August, to rescue hurt turtles and others in need and bring hatchlings into the center for treatment. They receive their funding strictly from donations and sales at the gift shop. The center is open from 9 am until 5 pm, and the cost of the center is $8 for adults, $7 for seniors, $6 for children 4-12. Children under three are free. So travel back in time to Jekyll Island. Enjoy a Victorian-age vacation with your family and friends, and live like the wealthy elite of early America for just a little while. I can attest to its beauty and its ability to transcend time itself. And don’t forget to end each day with a beautiful sunset! Get the Fodor’s The Carolinas & Georgia Travel Guide . Bring a good quality mirrorless camera for getting those beautiful St. Simons beach landscape shots. I use the Sony Alpha a6000 . Don’t forget sunglasses for the beautiful sunny days in Georgia. A.J. Morgan Unisex Sunglasses are a great choice and very affordable!